Welcome to Sacred Heart Academy! If you are looking for a quality Catholic education for your child that prepares them for high school and beyond, Sacred Heart Academy is the choice worth making. Sacred Heart Academy (SHA) opened its doors in 1897 and continues to welcome students and families to our innovative, challenging faith-based curriculum. Our parents are our partners, and together we form a community of individuals that values education and sets high expectations for our students, but in a supportive and nurturing environment with God at the center of our hearts. 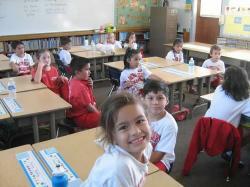 Sacred Heart Academy provides preschool and K-8 education to families from Redlands, Highland, Loma Linda, Yucaipa, Beaumont, and other areas of the Inland Empire. As a ministry of The Holy Name of Jesus Catholic Community, the school has been the root of excellence in Catholic education in Redlands for more than 120 years. We have sent forth into our communities leaders who are strong Catholic Christians, effective life-long learners, self-disciplined individuals and compassionate caretakers of creation. Sacred Heart Academy is a school community dedicated to proclaiming the Gospel in word and deed. We are a home, embracing families in an atmosphere offering a safe, productive and energetic learning experience with an emphasis on service to the community. We welcome all students with a generosity of spirit established on a firm foundation of academic excellence driven by Diocesan Standards aligned with California State Standards. Our legacy lives on in our graduates serving in leadership roles in our church, high schools, universities and communities. We invite you to call, visit us, and one day join our Sacred Heart Family! Does Catholic Education Make a Real Difference?